CARL RUSSO/staff photo. 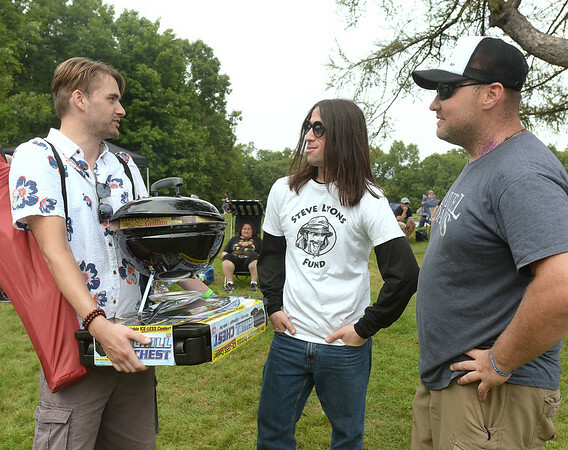 Joshua Paradis, left, of Haverhill who won some prizes talks to Jason Tziton, a friend of Steve Lyons who came from California to attend and David Lyons of Natick, Steve's brother. The Steve Lyons Fund hosted the annual Rock Out! Cookout on Saturday, August 25, at Winnekenni Castle in Haverhill. This family-friendly afternoon of music, food and fun benefited the Haverhill High School Marching Band Uniform Fund.